The beautiful town of Kasteli Kissamou is located 42 km west of Hania and it is the capital of the Kissamos county. Kastelli Kissamou is surrounded by beautiful landscape and has about 3.000 inhabitants. Kissamos is not a crowdy tourist resort, its development is based mostly in the wine and oil produce, and the agricultural products. Kissamos is the center of production and trade of the renown Kissamos wine. The climate of the area is excellent, with sunshine most of the year. Kastelli has evolved into quite a big town with all the comforts and the facilities that a town can offer. There is regular public bus service from Hania to Kissamos. From Kissamos harbor there is a regular ferryboat service to Gythion (Peloponnisos) and Kythira. Kissamos is built along a wonderful sandy beach. It is located where the ancient city of Kissamos stood. With Kissamos as a starting point you can visit the archaeological sites of Falassarna and Polyrinia, the Gramvoussa isles (pirate isles), the beautiful Georges of Topolia, Sirikari, the lagoon of Balos, the medieval villages, etc. The crystal clear sea and the vast sandy beaches of Kissamos make your holiday a unique pleasure. South of Kissamos, at a distance of 7 kms., are the ruins of the ancient city of Polyrinia. Polyrinia is considered to be the oldest city that the Dorians built in Crete (following the Minoan Period). One of its ports was Falassarna, the westernmost town in Crete. Polyrinia was a powerful city, its walls are still visible, and existed until the Byzantine period. Present day Polyrinia, is a small village, that is built with building materials from the ancient city. As everywhere in Crete the history of Kissamos goes far back. The name Kissamos is of pre-hellenic origin and it was the name of an ancient community that existed in the same place. The ancient Kissamos was a marine and commercial center of the Western Crete, and it was one of the Polyrinia's ports. Ancient Kissamos flourished during the Roman period and continued to prosper during the early Byzantine period when it was an episcopical seat. 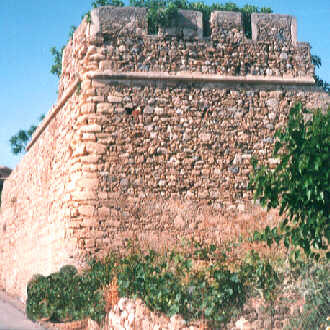 Kissamos was always a well fortified city, because due to its wealth and its location, was often under attack. The Venetians built the wall that parts of it are still standing inside the city. The Venetian fortress, Castelo, was the special characteristic of the city and thus the city was named after it Kasteli. Because in Crete there are many towns with the name Kasteli, it was named Kasteli Kissamou.